SlimComputer removes trialware, adware, toolbars, unwanted start-up entries and other unnecessary items from a PC. SlimComputer uses cloud technology and community feedback to provide recommendations about which programs on a PC are unneeded. Using real-time scanning and a live stream to a community-sourced data cloud, SlimComputer evaluates items on a PC and offers customized recommendations to improve PC performance. 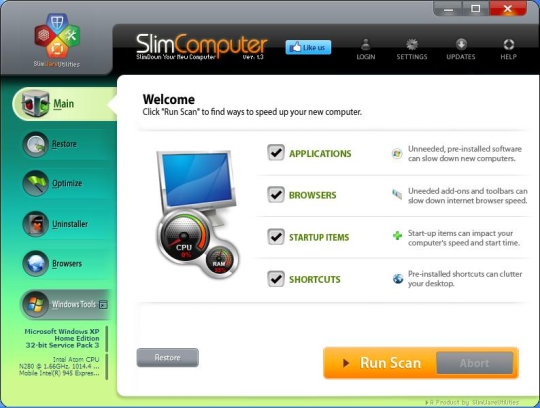 With one click of the run scan button in the SlimComputer main window, consumers receive information about which software, start-up items and toolbars are considered optional on their PC. The interactive assessments from the SlimComputer, user-based community provide information about the function and usefulness of each item on an individual PC. 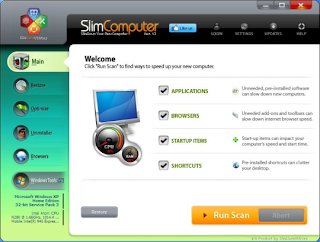 Users can receive and make recommendations about various pieces of software and rate applications all within the SlimComputer program. This community-based feedback and social infrastructure system separates SlimComputer from other PC cleaning and utility programs. User ratings make up a network of community-sourced data. Every minute, that community-sourced data is fed into a dynamic data-cloud. Every new toolbar, promotion, proprietary service even spyware and adware is catalogued instantly. As soon as the computing community knows about something, SlimComputer knows about it and establishes a profile for it. By accessing this contributivee cloud at all times, SlimComputer creates a customized cleaning profile for any given computer. In addition, SlimComputer provides a single dashboard for access to powerful built-in Windows tools, and can restore disabled start-ups, toolbars and short-cuts with one click. With its community-based feedback about applications and their usefulness.